Thread: Airflow: Is more ever too much? I have a suspicion based on the old EGO valves that a certain brit actually flow benched these things and found that much over 0.15" is no longer lift limited, but that's not necessarily an argument for restricting the lift to that level. If we are looking at a mechanical dwell, and the time we needed to open, longer 'over' lift would have no issue with adjusting flow then, since you would be over the saturation point - and it could allow for a consistent flow over a longer duration of time. Making adjustments more consistent through a certain range. This would allow for longer timing - and basically work well with the SC type of setup/tune. Which is how the Cocker was stock. I recall that it assorted something like the maximal lift varied mostly as the energy of the spring, but the total energy is dominated by the speed of valve reset, which is pure a=(return mass)/(return force) and t=sqrt(2*lift/a). 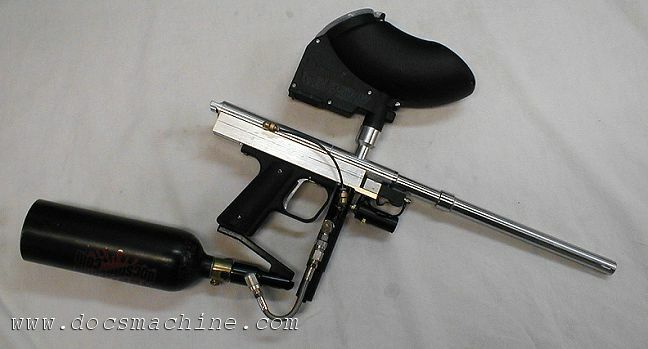 On that we can also look at the Tippmann to expand our thought process on this. They use a choke screw post valve to restrict velocity, while keeping the hammer spring constant. The energy in from the hammer was always constant to the valve, along with the operating pressure. With a choked setup you would have more feedback on the hammer o-ring, resulting in the hammer lifting off the valve faster, reducing total output, and lowering velocity. Along with a choked feed to the ball. Original spyders has a choke in the airpath between the two tubes to adjust velocity. It kept falling out though, and complicated things, so it was removed. If you guys want to chat about this here, that is fine. Not a huge amount to say before giving away the beans, but I think I can remember a bit you guys might like. Last edited by pbjosh; 12-03-2018 at 12:30 PM. Back again, and belated Merry Christmas to all, and preemptive happy New year! Josh, ^^ I'd be interested to learn more about that marker. Inception heavy hammer (plus cocking rod weight) - 58 g / 2 oz. Hope this helps refine the picture so far. I remember all the hush hush stuff on the Tinker's Guild back in the day regarding the Shiva development. Is it still in the works on a back burner? If not how does it stack up with how other marker development has progressed in the last 15+ years? Sheesh, Fred, are you everywhere? UPDATE: Went out and bought a high quality gauge and good thing, too. Actual pressure is right at 280. Will hope to do some testing this weekend using all the same parts where possible and a different body.